Recycle efficiently and you will greatly reduce your annual waste collection bill. Please place your recycling items in the BLUE lid bin. Clean Ireland Recycling will empty your blue lid bin on the same day every second week (along with the wet waste and food waste bins). Any contaminated bins (THAT IS BINS CONTAINING NON-RECYCLABLE ITEMS) will be emptied on the MW side. Recycling items are sorted through a combination of automation equipment and hand sorting on a picking line. After the items are sorted, they are baled separately. For example: Cardboard Bales, Can Bales, Newspaper Bales, etc. They are then shipped to their destination for further processing into the end product. 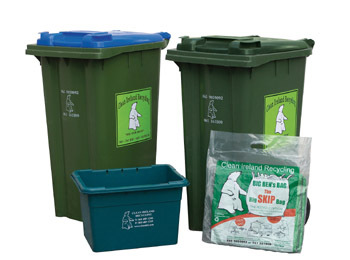 Order a Residential Collection Service from Clean Ireland Recycling today. Rigid plastics can be recycled. Soft plastics can’t be recycled. See www.recyclinglistireland.ie for more information on this.